Before you can start using the Rhythm Tracks for NWC app, you have to enable MIDI support in a Google Chrome browser. Given the developmental state of Chrome’s MIDI support, we recommend that you install and use the Chrome portable app with any web MIDI apps. This will also make it easier to diagnose problems when using the MIDI functions found in Chrome. Click the enable link, then completely shutdown and restart Chrome. If you are using the full desktop install of Google Chrome, then you might have have to restart your computer before the process of fully enabling MIDI can be completed successfully. The app starts by showing the current settings for trigger resolution, beats per bar, number of bars, tempo, drum style, and drum kit. Any settings that have not been coded into the app’s URL can be changed before powering the app. If a setting is disabled (cannot be changed), then it has been coded into the link/URL used to open the app. The above link does not hard code any of the app’s settings, so they all can be configured in this opening panel. Once you have set all of the options as needed, the Power On button will actually start the MIDI app, open all of your computer’s MIDI devices, and initialize its browser interface. If you get an error after powering the app, then MIDI is probably not yet enabled correctly in your browser. Review the previous section for more details. The spacebar can be used to start and stop playback of the drum loop. The triggers can continue to be edited while the loop is playing. 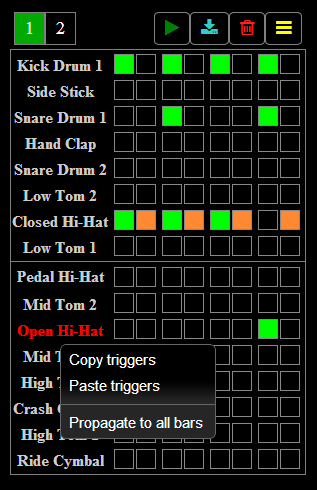 Right clicking on a drum name provides a special menu where the drum’s current bar triggers can be copied and pasted into another drum. If the pattern has multiple bars, then the drum’s current bar can also be propagated to all other bars from this menu. The pattern can be exported to NWC at any time using the blue export tool button, which is located next to the play button on the toolbar. 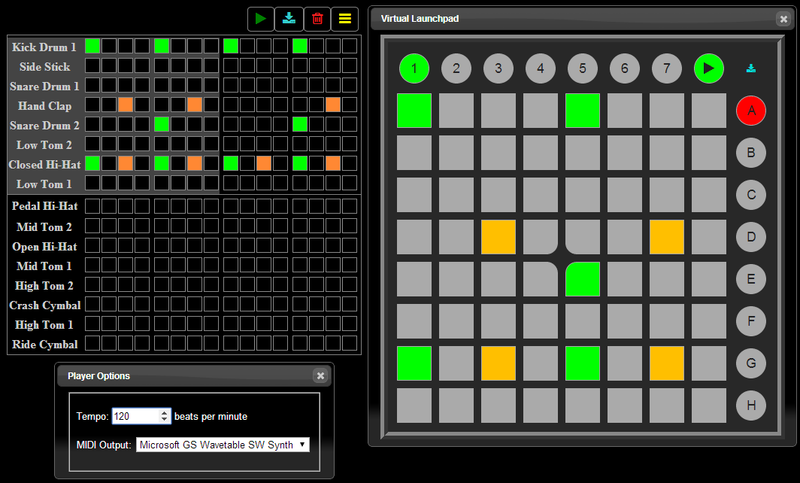 The top right drop down menu includes several other useful commands, including a Virtual Launchpad (which mirrors a real Novation Launchpad Mini, if you have one), a Player Options panel (where tempo can be changed), and Share command where you can retrieve a link that represents your drum loop and can be used to reconstruct it later, or share it with others. 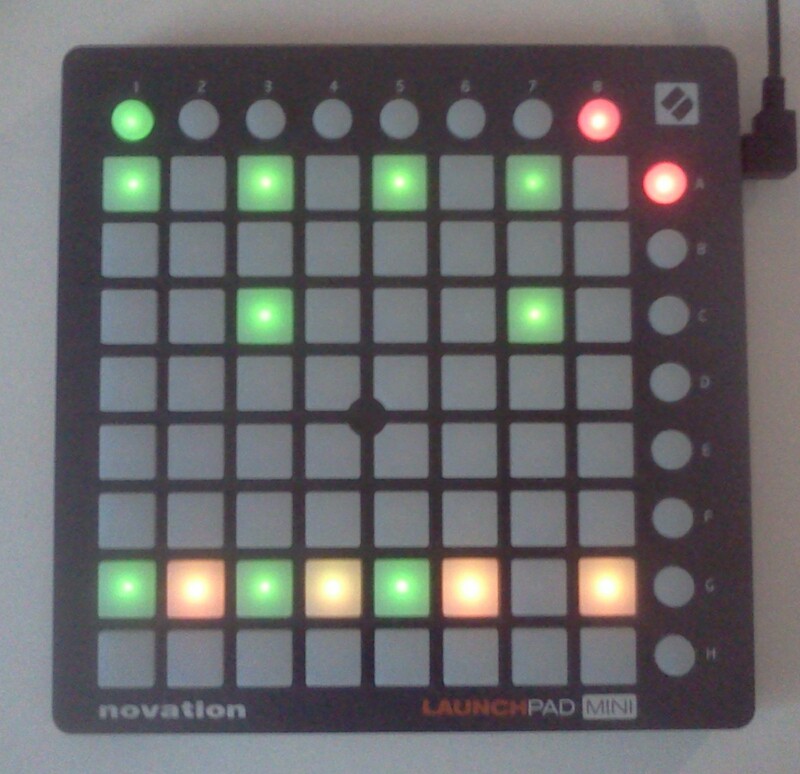 If you happen to have a Novation Launchpad, the app should automatically detect it and enable it for accessing the drum patterns. The top right button can be used to start and stop play back. The interior square buttons are overlayed with the drum triggers found on the computer screen’s drum list. The remainder of the top and right side perimeter buttons will move the overlay window view through the drum triggers. The top buttons move the overlay to later triggers in the bar, and the right side buttons move the overlay down to lower drums. This entry was posted in Announcements and tagged rhythm, webmidi by admin. Bookmark the permalink.